The CISO, Head of Human Resources, CIO, and Chief Legal Council are not the cast of characters you would expect to see solve a data protection challenge. Yet, the GDPR’s far-reaching impact has forced teams who typically don’t work together to collaborate to solve a nuanced problem they never thought they would have. 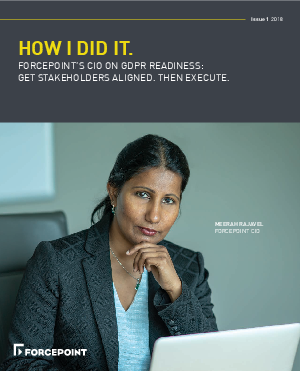 Get a firsthand account of how Forcepoint’s CIO, Meerah Rajavel prepared for the regulation including collaborating with all stakeholders to jointly determine how the regulation applied to each part of the business and implementing a path to compliance.